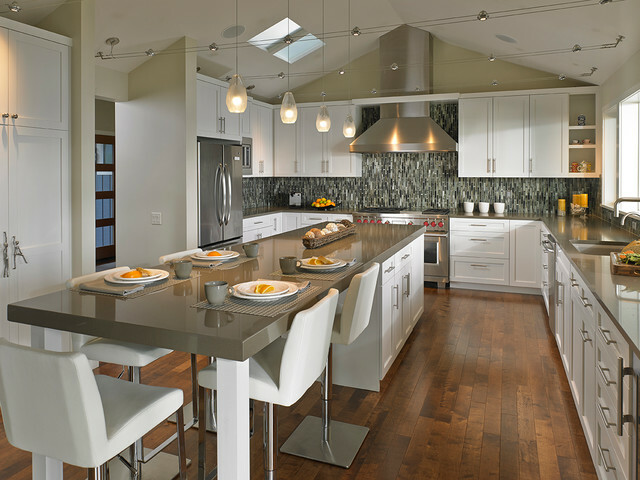 Love the cabinets. Who makes them? They are painted with a high gloss paint. 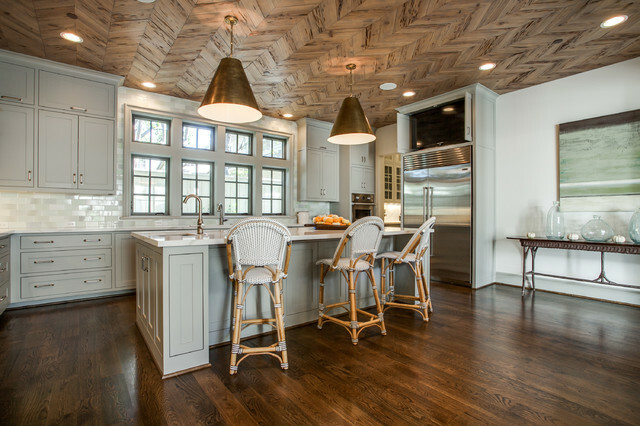 Love the combination of finishes! 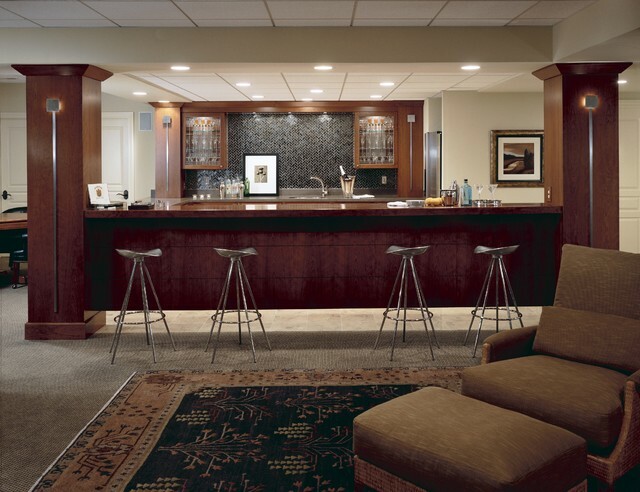 - I was curious to find out what type of shelves were used in this project? 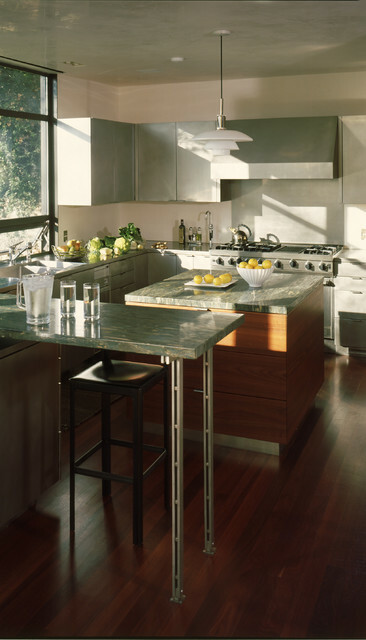 The cabinet base width from end to end which includes the paneled refrigerator is 16' 7-1/2". I hope that helps. Never mind the wonderful home...where is the cat's litter tray and snuggly sleeping place? I love this! What is the model/brand of the refrigerator? 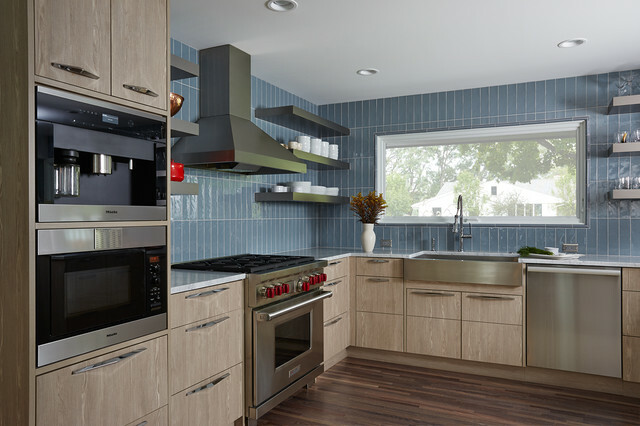 I WANT TO ADD A PUNCH OF COLOR TO MY ALL WHITE KITCHEN, WHAT COLOR AND BRAND OF PAINT WAS USED ON THE CABINETS? - Did you consider locating the fridge on far left? 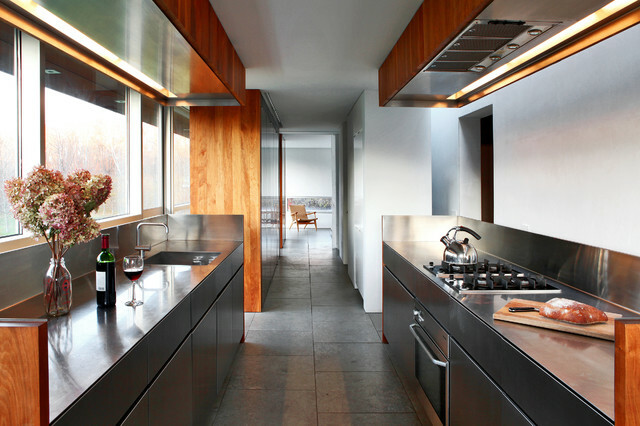 A boxed in kitchen wasn't the aesthetic we were going for. What brand of fridge is this? - I like the concept. But where's the fridge? Is it a drawer? The fridge is paneled, the furthest cabinet on the right. 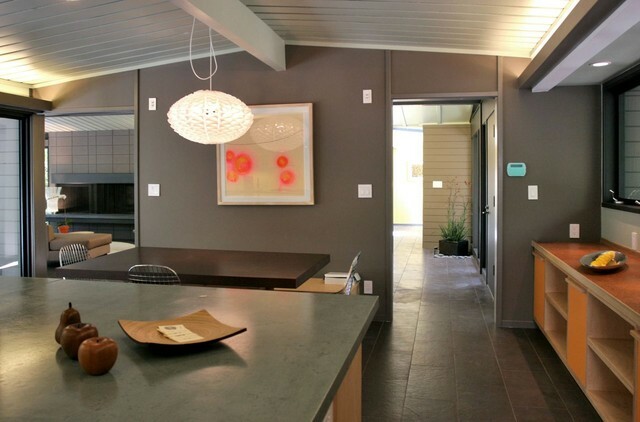 What is the length of this efficient kitchen wall - from sink to fridge? - What do you use to access the high cabinets? I'm not sure which particular stool the homeowner has purchased for this. - I love the couch, where is this from? Love the table. Where did you get it from? What is it made of? 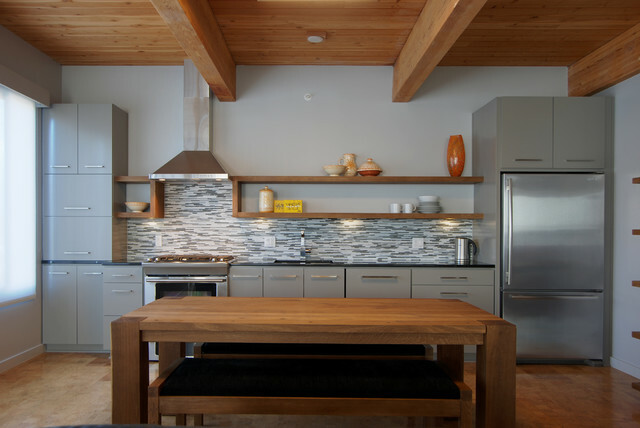 - Where can I find the steel backsplash sheet? - I noticed the ovens next to the refrigerator. Is that ok? I mean, when the ovens are in use, does that affect the refrigerator's performance? They just seem really close. 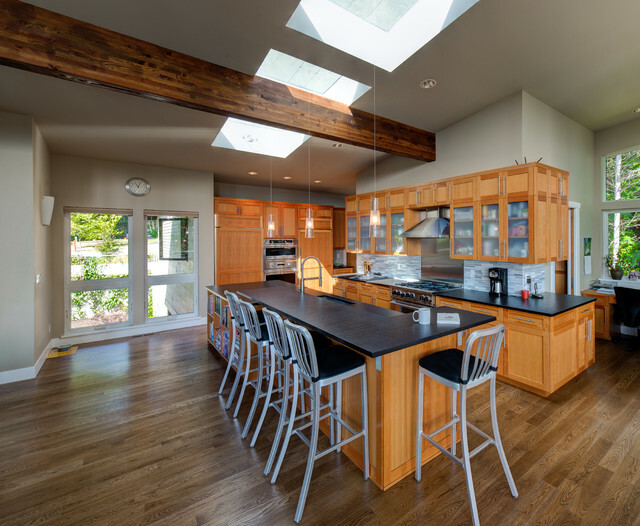 Often a single-wall kitchen is used for the efficiency of space within the whole house, rather than just for the efficiency of the kitchen. 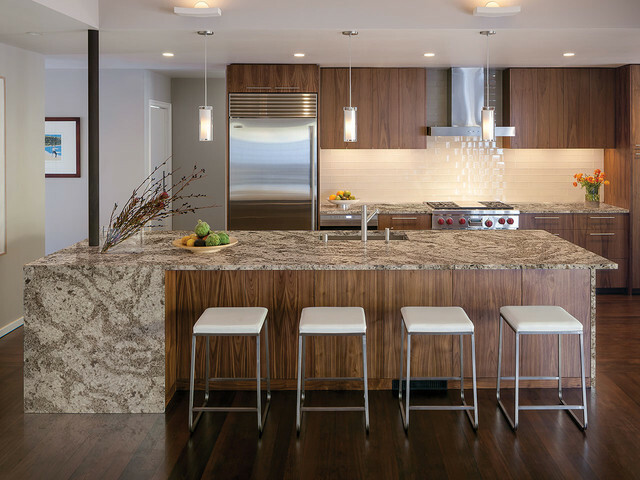 This houseboat is a good example of a home where the footprint of the kitchen needed to be minimized. 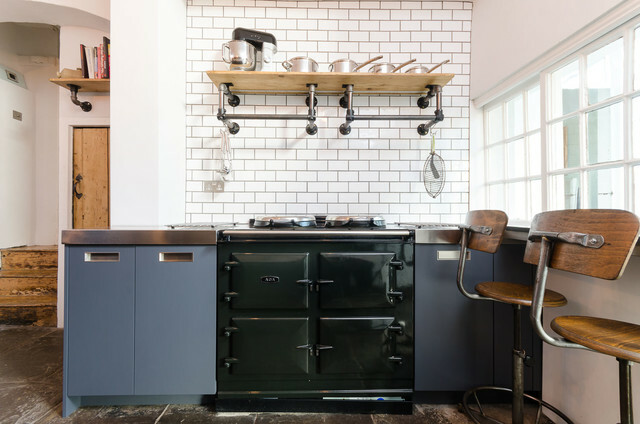 Like the previous example, it is a handsome design that fits well on one side of the living space.Also, this layout illustrates one change since the days of the middle of the 20th century, when the work triangle was being developed: The oven and stove are not a single appliance. 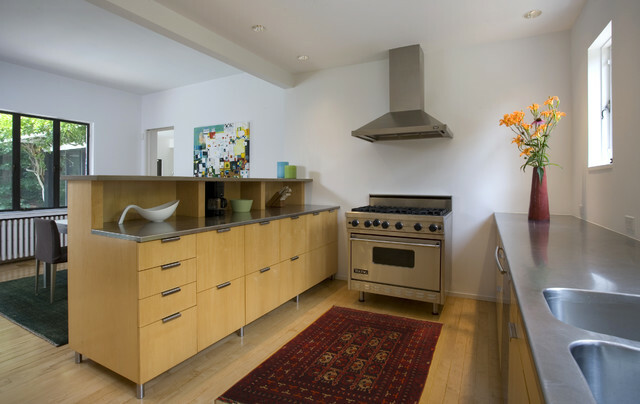 Here a double oven sits next to the refrigerator at right, while the stove is located between the refrigerator and the sink on the far left. 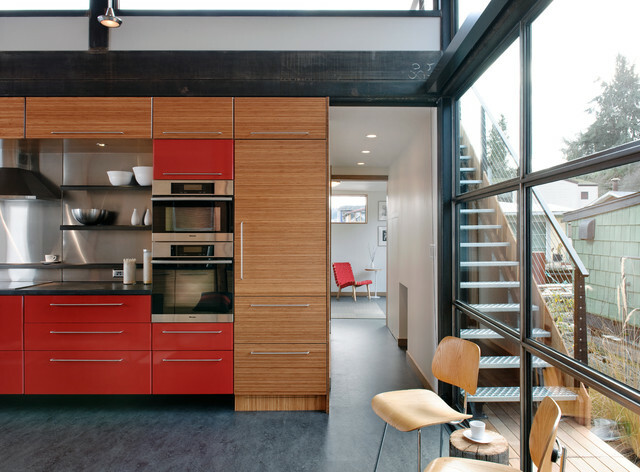 I love the eye-catching red cabinetry in this fetching open-plan kitchen. 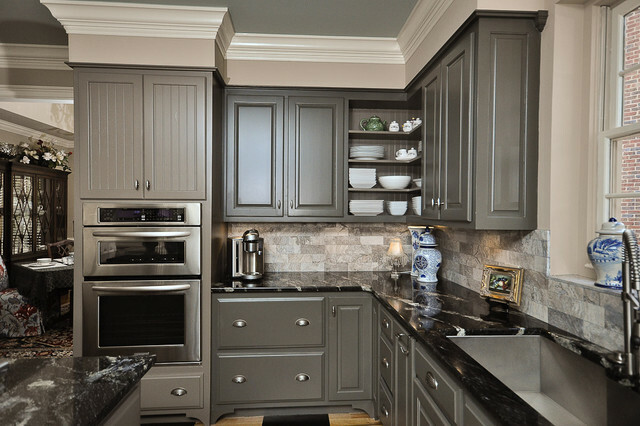 If you opt for a bold hue on your base cabinets, consider using a neutral hue for your upper cabinets or installing open shelving. 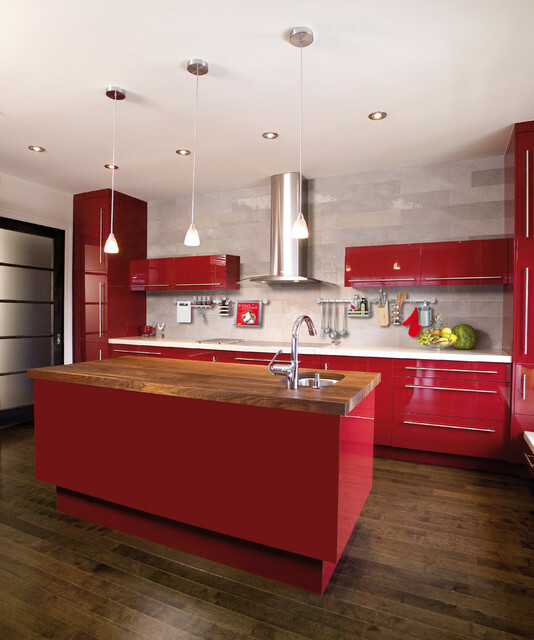 Either move will break up the red and keep it from becoming overwhelming.Tell us: Have you used red in your kitchen? Post a photo and share details in the Comments section below! 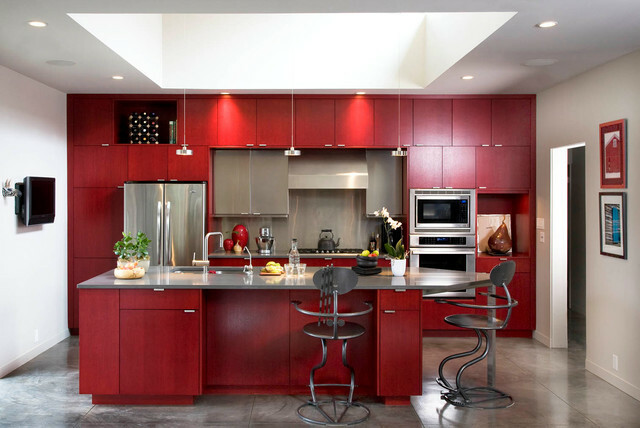 As an appetite-stimulating color, red is a great hue for kitchen cabinets. 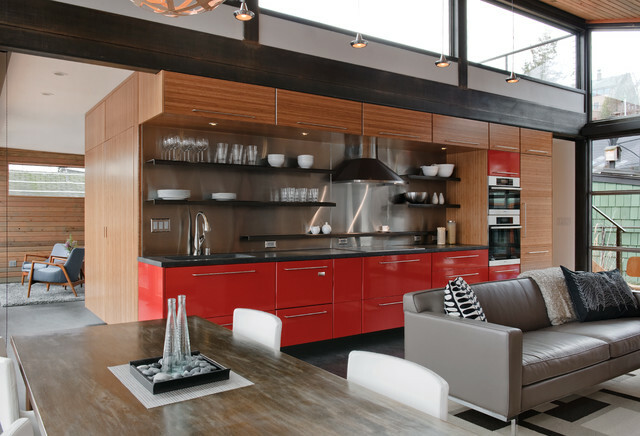 The remaining materials and furnishings here are a nice mix of light and dark neutral colors, creating pleasing balance with this intense red. Kitchen Accessories- no drilling required!